a third runway at London Heathrow airport. But this will be subject to certain conditions being met. said: “This is fantastic news that will be met with great relief. to anybody who understood the impact aviation has on our climate. The policy may send birds in the Thames Estuary flapping for cover, though. eastwards for a new airport. by a tax on the plane, not passenger. policy, which will play out in time. the timing of any plans. nuclear, though, so the stations will get built – if conditions are met. unless they are offered better incentives. Democrat environmentalists for the next election. many of whom are sceptical about man-made climate change. for instance, a major low-carbon hub. This may be a source of future tension. and the roll-out of “smart” interactive local electricity grids. vehicles, though it is not clear what “mandating” means and who is to be mandated. standard, though the standard is still to be decided. Finally, a measure that might affect many people’s lives – if it is implemented. to roam in the countryside in the Scandinavian fashion? landowners have barred the gate. of a high-speed rail network. 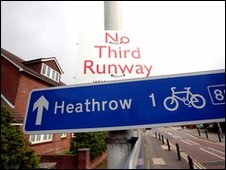 The cancellation of the 3rd runway at Heathrow. to make up what they feel is a shortfall in flights. LCY and beyond. The stampede to lobby them has already begun. Posted: Wednesday, May 12th, 2010. Filed in News about Airports.